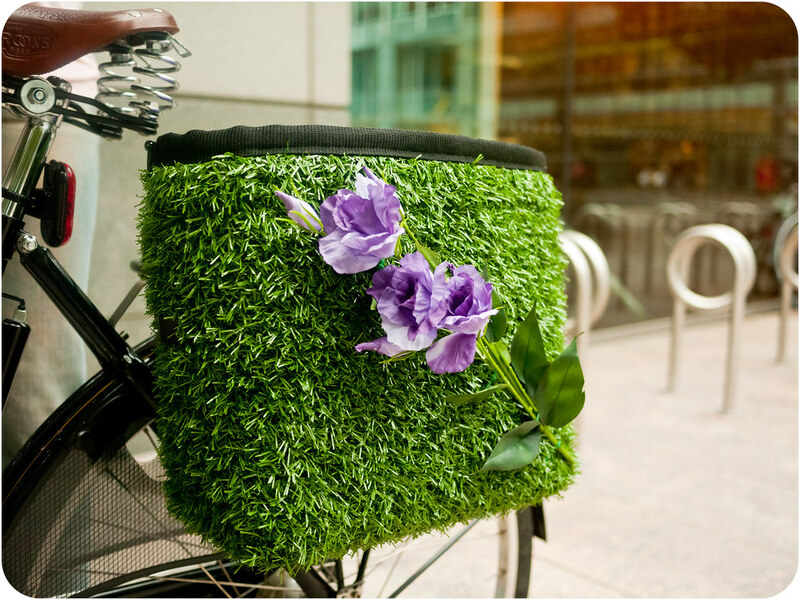 The material the Grass-Shopper is made from is something that I have never seen on the Pannier market before: it consists of a single piece of Astroturf (artificial grass) which has been carefully hand stitched and riveted into making a very sturdy Pannier. Already unique in design, you have the option of customising the bag by choosing the colour of the waterproof drawstring liner, floral decorations & how the bag attaches to your bicycle. 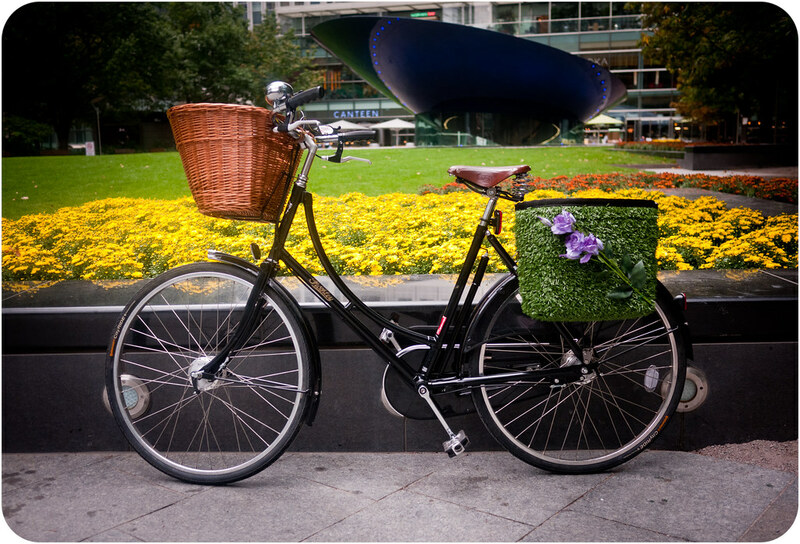 I opted for Purple lining, Lisianthus Flowers, and Hook attachments in order to use the bag on my rear rack. I think the customisations are a really nice touch, as it allows you to personalise the bag to suit your own style and the style of your bicycle. 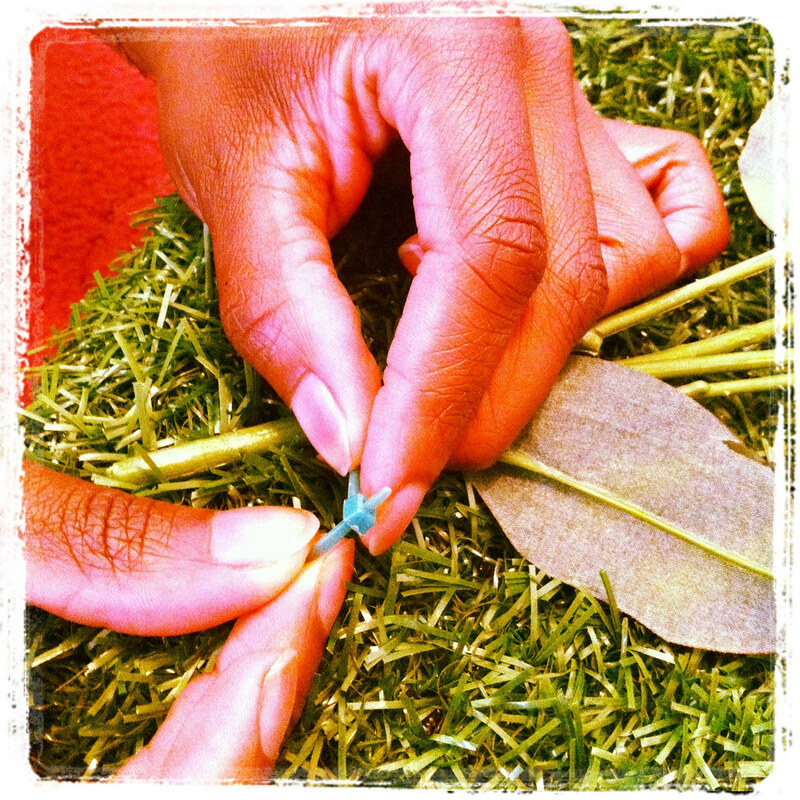 Fixing the artificial flowers onto the Grass Hopper was easy to do: using the generous supply of Cable Ties provided, you simply thread them through the bag and tighten around the Stems. 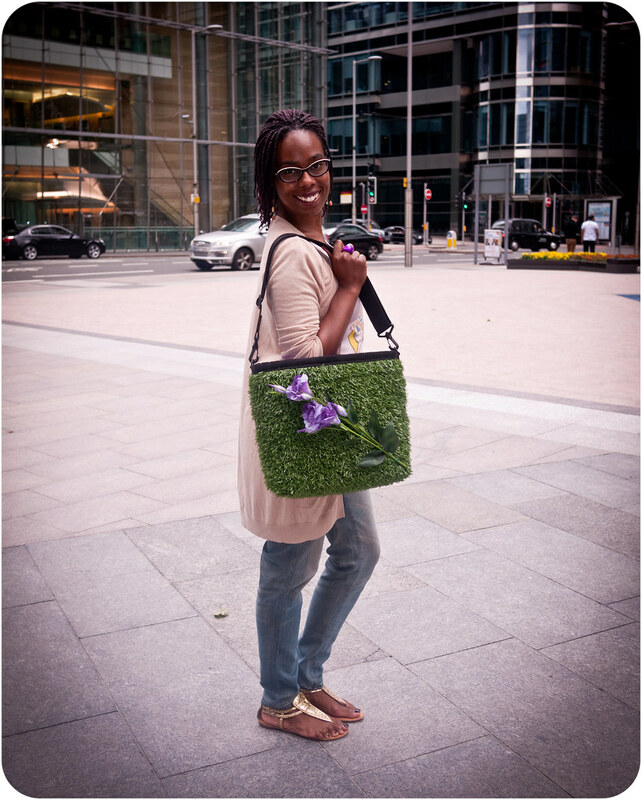 Both the Stems and Leaves on the Flowers are made from flexible materials, meaning you can arrange the “floral spray” into almost any position you want on the bag. Attaching the Grass-Shopper to my Pletcher was simple: the size of the rack was not an issue and both hooks clipped onto it easily and locked into place. 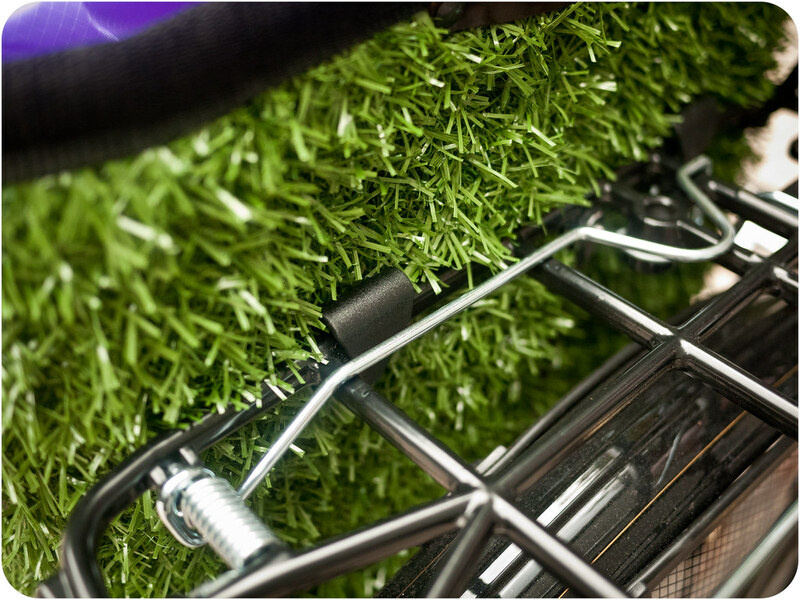 With these hooks, the bag should fit on any standard sized bike rack (the ‘Strap’ attachment option is designed to fit outsized rack rails). Testing it with a gentle tug, the bag didn’t come away from the rack and was a great fit. 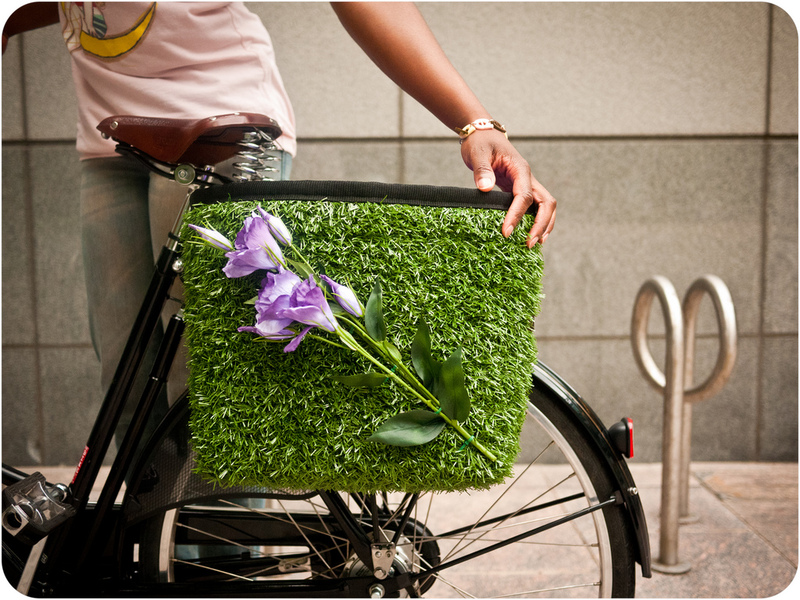 The hooks are small in size and blended in so well with the colour of my Pashley, it actually looked like the bag had bloomed from my bicycle! 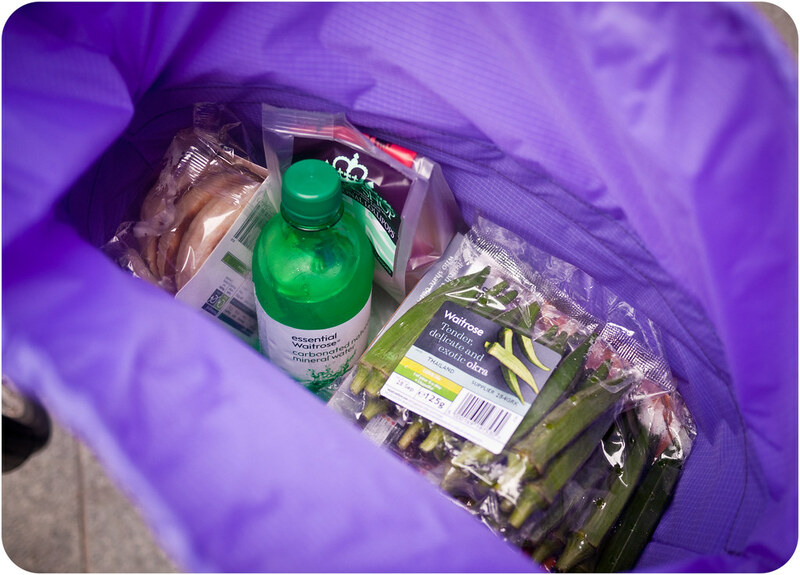 Of course, it was important to know just how well the bag fared when on the move with weight inside of it & how accommodating the dimensions of the bag are. I decided a good test for this would be to use it for some grocery shopping. 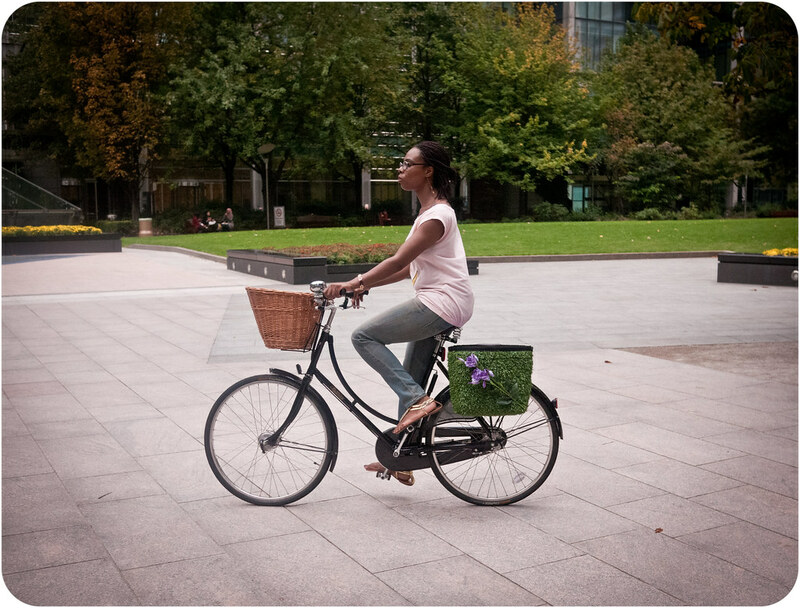 As the Grass-Shopper comes with an adjustable & detachable shoulder strap, you can take it off your bike and use it as a normal “everyday” casual bag – a brilliant feature indeed! 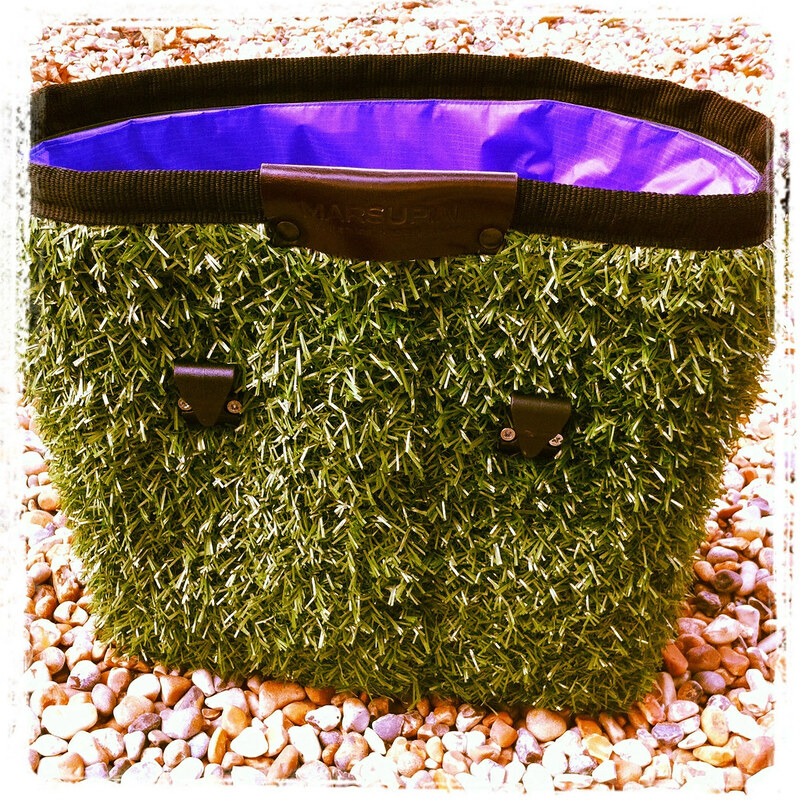 Instead of my normal “Bags for Life”, I used the Grass-Shopper to pack my groceries in. It certainly attracted a lot of lovely attention in the supermarket and didn’t disappoint with the amount it could hold… (what you can’t see are the two boxes of sticky Chicken Wings and a large bag of oven chips concealed under the healthy stuff!) – it held my shopping in place & still had room to spare. While cycling, it sat comfortably on the back: it didn’t knock or sway against the wheel, nor did my leg touch it when I was pedaling – I’m a tall girl, so this is a very important thing for me! The bag remained securely attached to my Pashley riding back home with my shopping. All things considered, I think the Marsupial Grass-Shopper is a fantastic bag. It’s a refreshing take on the world of Panniers: the design is unique, very eye-catching and makes a fashionable addition to your bicycle. The fact that it doesn’t ignore the practical elements of a Pannier is also a plus: made from durable material, it has a sturdy build and should last you a very long time. I look forward to seeing more designs and products from Marsupial in the future, especially if they are as unique as this. 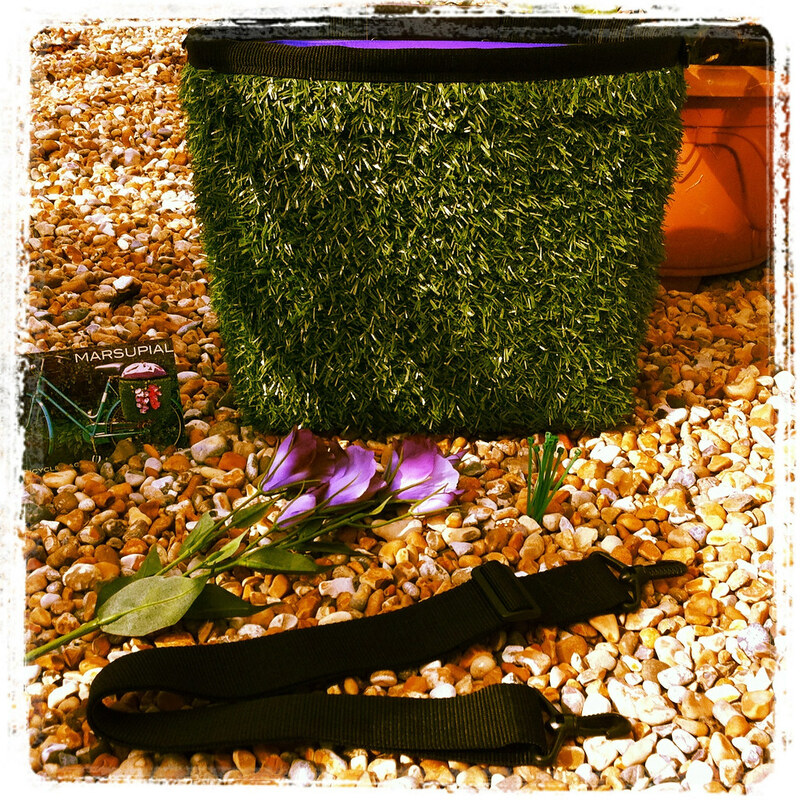 The Grass-Shopper can be bought directly from Marsupial Bicycle Bags, or from the following stores as listed on their stockists page. *This bag was kindly gifted to VCG by Marsupial Bicycle Bags for a review. 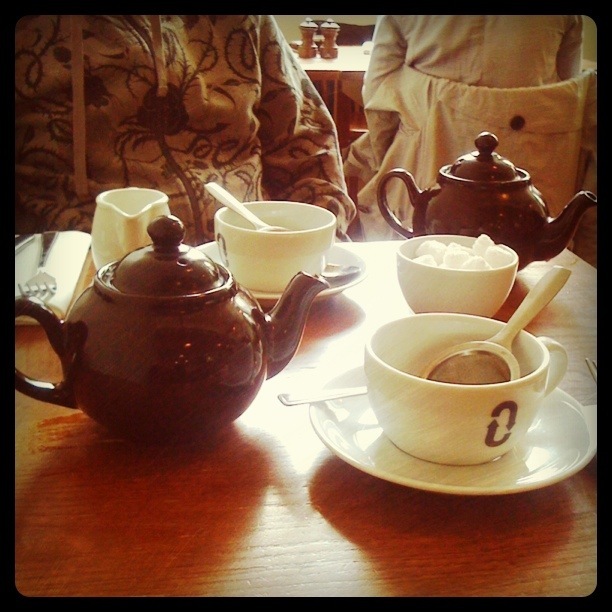 ooh, i like it! 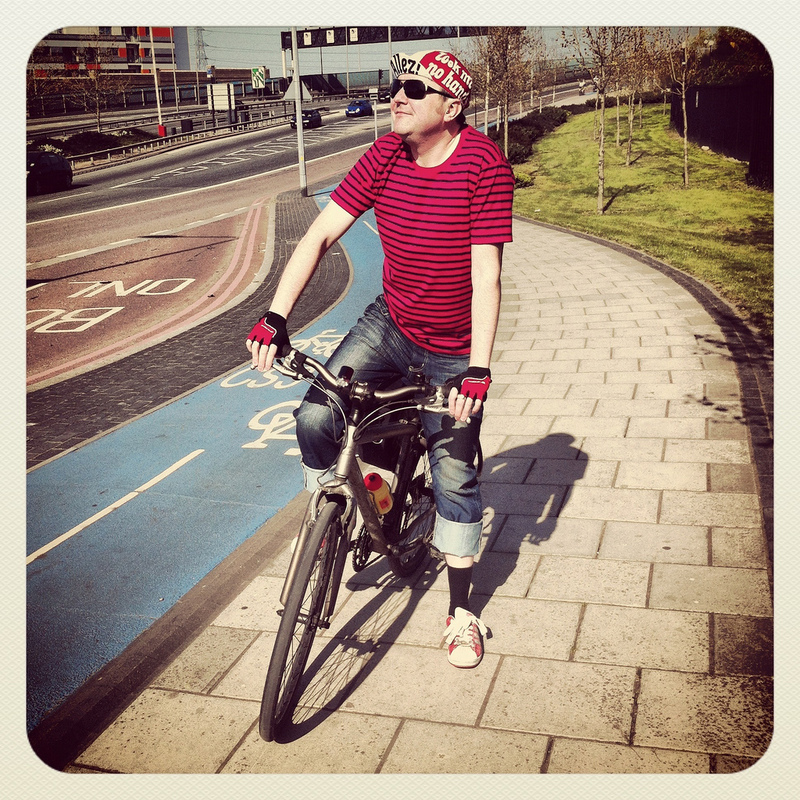 i would really like to find a nice pannier for my pashley! That is the most beautiful pannier (and bike)I've seen in a long time! utterly gorgeous! want to put this on my Pashley! most panniers just don't do the Pashley justice. this is sooo pretty.